Bring your family and join us for a camp out on the front lawn. This Family Night will include: guided star gazing with Don the Comet hunter and his telescopes, s'mores, campfire stories, free pancake breakfast on Friday, morning time in the inflatables. Families will have the opportunity to explore the visible power of our invisible God. Though we can't see God, we can learn about God through His creation. We will have devotionals in which families can participate, if desired. 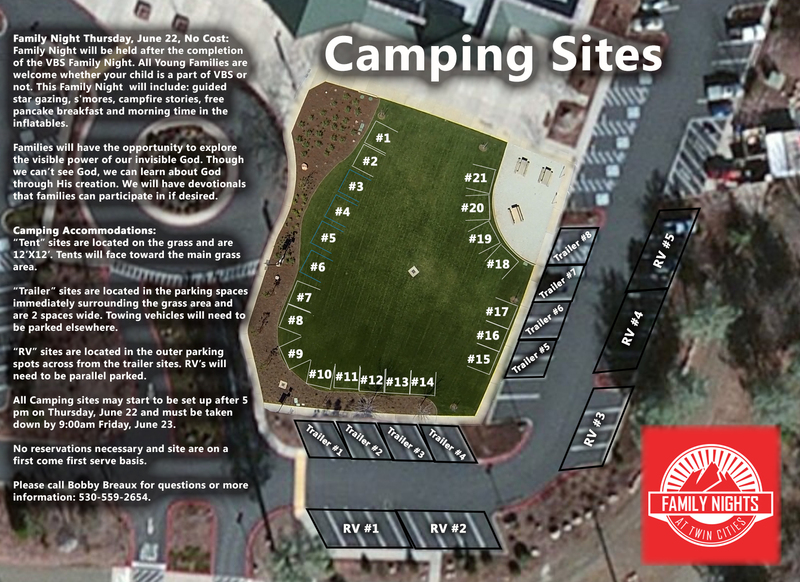 Click here to view a map of the campsites. Campsites will be on a first come, first serve basis. Please call Bobby Breaux for questions or more information: 530.559.2654.